On March 27, 1775, Future President Thomas Jefferson was elected to the second Continental Congress. 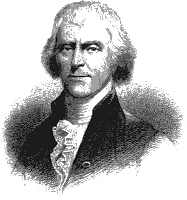 Jefferson, a Virginia delegate, quickly made a name for himself in the Continental Congress with the publication of his paper, A Summary View of the Rights of British America. Several more papers would follow in the coming year, including Drafts and Notes on the Virginia Constitution. In June 1776, Congress assembled a committee to draft the Declaration of Independence. Following a great deal of discussion, the committee selected Jefferson to compose the document. At just 33 years of age, it only took Jefferson a couple of days to complete a draft of what is regarded as the most important document in the history of democracy. After a few small changes, the committee submitted the draft, titled A Declaration by the Representatives in General Congress Assembled, to Congress on June 28, 1776. The document was formally adopted by Congress on July 4, 1776, under the new title The Declaration of Independence. Jefferson continued drafting other historical documents thereafter, including a bill establishing religious freedom that was formally enacted by Congress in 1786. He served as Virginia’s governor from 1779 to 1781, minister to France from 1784 to 1789, and as the first U.S. secretary of state under President George Washington from 1790 to 1793. Quite a resume, huh? But that's not all. Jefferson served as vice president under President John Adams from 1797 to 1801 and afterwards was elected the third president of the United States, a position he held for two terms from 1801 to 1809. After his presidency ended, Jefferson retired from public life to his home in Virginia. Jefferson died at 83 on July 4, 1826 -- 50 years to the day after the signing of The Declaration of Independence. There's no question that Jefferson is considered one of the best presidents in U.S. history. In addition to writing The Declaration, he's most remembered for spearheading the Louisiana Purchase of 1803. In Jefferson's day, the secretary of state post -- and not the vice presidency -- was considered the true stepping stone to becoming president. John Kerry, the current secretary of state, is the 68th person to hold the office since its creation in 1789.